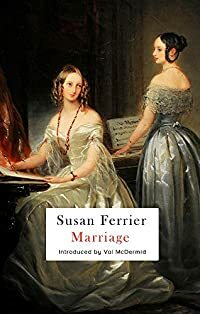 Marriage by Susan Ferrier was completely unknown to me until I saw it displayed in Kirkcaldy’s main library recently. I had never even heard of the author but she was a well known and successful author in her day – and a friend of Sir Walter Scott. Marriage was first published in 1818 but Virago reprinted it recently. She was writing at the same time as Jane Austen of course but her writing is completely different and so much more modern in feeling. In the blurb Susan Ferrier is described as having been one of Scotland’s greatest writers – I certainly enjoyed this one. When the novel begins Lady Juliana is just seventeen – and a half as she says. Her father Lord Courtland has decided it’s time to speak to her of marriage, he obviously wants to see her settled with a wealthy husband. Juliana is of a more romantic temperament and she believes that she should be united to the choice of her heart. The upshot is of course that Juliana rejects the elderly and unattractive gentleman chosen by her father and she elopes to Scotland with a handsome young man that she has only just met. He’s a penniless soldier but he comes of a ‘good’ family who own an estate in Scotland. It’s all a huge eye-opener for Juliana as life in a remote part of Scotland amongst her husband’s very eccentric relatives is not what she expected it to be. There’s no money despite the estate and it isn’t long before Juliana is the mother of twins! Both girls. Juliana can’t even bring herself to look at the smallest child as she’s not pretty like her sister and she gladly gives Mary to her husband’s childless aunt to bring up. Juliana regrets hugely her elopement and leaves her husband, taking Adelaide with her to London. After sixteen years Mary gets the opportunity to go to London and meet her mother and sister for the first time. Of course the sisters are like chalk and cheese with Mary being strictly brought up to put others first and Adelaide turning out to be a spoiled brat – just like her mother. There’s a lot of humour in this book and a lot of Scotland too, some great characters and a lot of observation on human nature and character. Like many writers around that time Ferrier delighted in giving some of her characters apt names including one Doctor Dolittle, a name which was taken up over 100 years later by the author Hugh Lofting. She was paid much more than Jane Austen was for her books, it must have helped to have Sir Walter Scott as a friend. Unfortunately she only wrote three books as she ‘got religion’ and gave up writing to concentrate on that although to be fair she campaigned for the abolition of slavery and probably thought that was more important than writing entertaining books. If you are interested in giving this book a go you can download it from Project Gutenberg here. The Virago book has an introduction by Val McDermid.